Join us in celebrating not only the New Year, but our 15th Birthday! 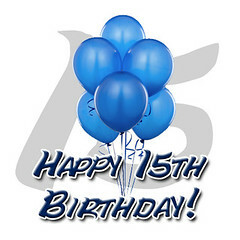 That’s right, we are celebrating our 15th year in business in the Phoenix area. We began this journey in 1996 with a single power washer. We have steadily grown and built a company that continues to be associated quality service and customer satisfaction. Our team now comprises an experienced staff of 12 employees and boasts an impressive fleet of 7 top-of-the-line industrial pressure washing machines and 4 industrial street sweepers! In addition to our industry-leading pressure washing services, we now offer a wide array of exterior maintenance services including commercial property maintenance, construction cleaning, street sweeping, epoxy, stain, and paver sealing. We would not be here without the support of our customers and vendors. We genuinely appreciate your business and/or interest in our services over the past 15 years. If you are not already an active customer, we invite you to check out our websites below to learn more about us and as always, estimates are free! Just call 602-373-1515! From our families to yours, we wish you a Happy, Healthy, and Prosperous New Year! As we approach the end of another year, we just wanted to take a moment to express our appreciation for all our customers and vendors that have helped make 2010 such a great year. We wish you and your families a safe and joyful holiday season and a very prosperous New Year! Our sweeping services include a powerful Tymco210 industrial street sweeper cleaning the parking areas and roadways for apartment complexes, commercial property managers, residential homeowner associations, etc. Each service includes the use of backpack blowers to manually blow leaves, trash, and debris from attached walkways, dumpster enclosures, and corners of the parking areas. Each Tymco210 sweeper is equipped with a powerful vacuum head which is capable of picking up leaves, trash, dirt, and debris and a side power broom for curb detailing. Sweepers also use a water system to minimize dust and all sweepers are PM-10 compliant. 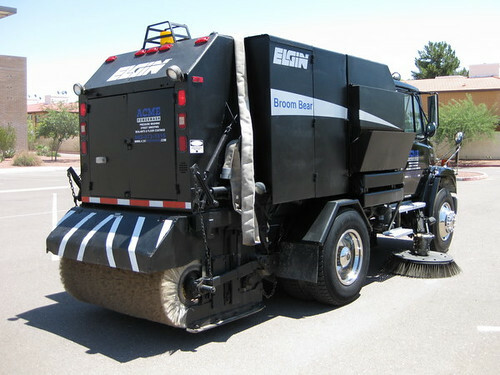 The Elgin Broom Bear is an industrial mechanical-broom sweeper that cleans up leaves, trash, dirt, gravel and debris. It makes an excellent choice for controlling track-out at construction projects and cleaning up roadways and parking lots for property managers and HOA’s. 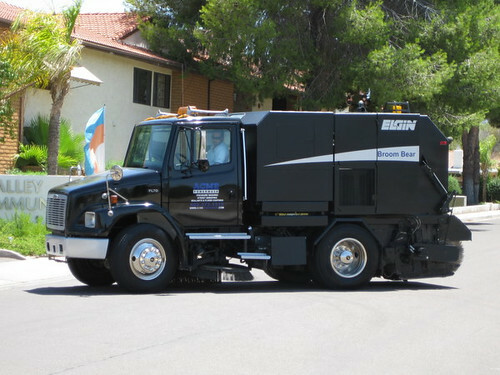 The full rear broom on these street sweeping machines is what sets them apart from regular vacuum trucks and air sweepers. The broom picks up rocks, gravel, and larger debris that standard sweepers leave behind. ACME Broom Bear Sweepers use on-board water systems to keep dust down and all our machines comply with PM-10 regulations. Visit http://www.acmepowerwash.com/sweeping.html to see more photos of our sweepers or call us today at 602.373.1515 to request a free sweeping estimate for your next project. The “official” first day of spring is just a few weeks away! Even with all the recent rains, we can’t help but feel that change is in the air: wildflowers are blooming in the desert; Cactus League Spring Training games are in full swing this week; and ACME Powerwash is helping residents and businesses with their “Spring Cleaning”. We have been hard at work getting their properties cleaned up in preparation for a beautiful spring. Many of us are expecting visitors this spring, some of us might be throwing a St. Patrick’s Day party, or if you are like us, maybe you just want to get things cleaned up so you can get outside and enjoy the beautiful spring weather. Regardless, this is the time to get outside and clean up mud and debris from the recent rain, pressure wash that patio/pool area that hasn’t been used in months, or spruce up those pavers with a good thorough cleaning and sealing. Whatever your needs are, we would love the opportunity to help you out. Visit our website to learn more about our powerwash services or call us today for a free estimate at 602-373-1515. Is your parking lot covered in trash? Or fallen leaves from the fall/winter? 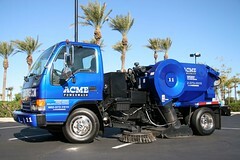 ACME’s fleet of industrial sweepers is geared up and ready to help get your properties looking like new again. Visit our website to learn more about our sweeping services or call us today for a free estimate at 602-373-1515. One of the easiest ways to clean up a large amount of dirt in a brand new parking lot is to hire a sweeping company to come in and clean up the mess. ACME POWERWASH, INC’s sweepers are Tymco 210 Regenerative Air Sweepers with a side mechanical broom and on-board water system. The brooms and large vaccum head excel at picking up various trash, leaves, dirt and debris. The water system helps keep dust down to a minimum. All sweepers are PM-10 compliant (particulate matter is not allowed to escape into the air). ACME POWERWASH, INC is a registered subcontractor with the Maricopa County Air Quality Department (MCAQD). Two-man crews are typically sent out so one technician can blow or hand sweep sidewalks and other areas that are not accessible by the sweeper. In addition to construction cleaning, the sweepers also work well for parking lot cleaning at commercial centers, private home associations and communities, parking garages, office complexes, etc. 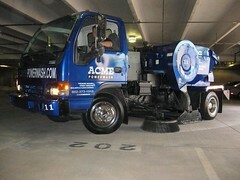 For more information on the ACME POWERWASH, INC fleet of sweepers please visit their page online at http://www.acmepowerwash.com/sweeping.html or call 602.373.1515 for a free quote. Powerwash or Powersweep? Whatever it takes to get the job done right. 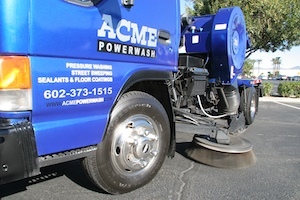 ACME POWERWASH now has street sweepers to maintain parking lots and parking garages for businesses in Phoenix, Scottsdale, and other surrounding communities. We maintain parking lots and parking garages for a variety of customers including office complexes, retail strip malls, property management companies, restaurants, hotels, condominiums, etc. Our street sweepers are available for one time cleanings or daily, weekly, and monthly maintenance programs that will keep your properties looking great. Our sweepers pick up a variety of dirt and debris including trash, leaves, gravel, etc. Sweeping your asphalt and concrete surfaces prolongs the life of your parking area, reducing the frequency of resurfacing and other costly maintenance. 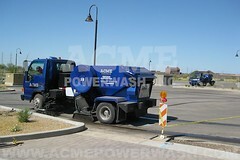 Visit our website to learn more about our Parking Lot and Street Sweeping Services at http://www.acmepowerwash.com/sweeping.html. Or call us at 602.373.1515 for a free estimate!